Well, he definitely experienced one of those bittersweet moments, clearly evident from his loud laughter during the movie at some of the hysterical Ranbir Kapoor moments (of which there were many). As I write this, I am aware that many of us have decided we don’t want to watch Ae Dil Hai Mushkil (ADHM), and I am not about to go into the politics of that; but having just walked out of a packed cinema in Basel, Switzerland showing ADHM… and still trying not to give away too much… This is what I have to tell you in some BIG BOLD HEADLINES! First the bitter, and then the sweet – here goes (I can see the die-hard Karan Johar fans switching off now but be patient my dears, let’s keep it balanced): Sachchi baat kabhi kabhi karrwi bhi lagti hai … you know, bittersweet? 1. Karan J seriously needs to get over his Kuch Kuch Hota Hai fixation. The movie is dead and gone, many many years past. Yes, it had a smogasbord of memorable moments and dialogues. Yes, it was a super-duper hit. Yes, we all loved it. But, please, add some original dialogues to your new films, we don’t need heavily contrived punchlines borrowed from old blockbusters, even if they are your OWN. Find a new scriptwriter if that’s what it takes! Karan Johar, we know you can do better than that. You need to up your game. 2. Fawad Khan can act, if he is granted maybe just two more minutes on-screen time, maybe? 3. The ending was long … very long … even for a KJ Bollywood flick. b. A snappy song-and-dance routine (with a track they can hum when walking out). Shrek did it and, boy, were they successful! Anything in-between is just that: in between. Neither here nor there, but everywhere. 1. 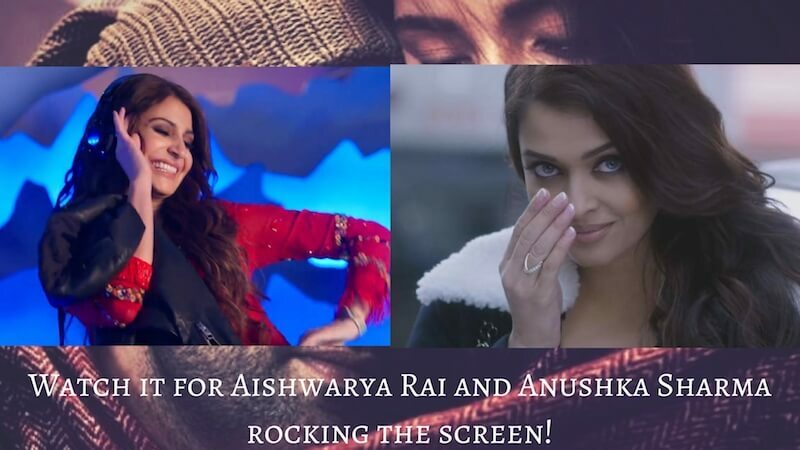 Watch it for Aishwarya Rai and Anushka Sharma rocking the screen! Both the actresses stole the show! Anushka is already warming up as the next best thing to happen to Bollywood after Rani, Kajol and Preity. (The next best thing that happened to KJ too, as she really did shine, especially in the first half – including the way she carried off that trendy wardrobe of hers). I, for one, am going to check out some vintage jackets this season. Aishwarya was just stunning. Her dialogue delivery, character and cool, calm persona was such a pleasure to behold on screen! Love, love, love her comeback here. 2. Watch it if you’re a fan of Urdu, and love to hear it spoken well. Bollywood has done it this time – some great dialogues in ADHM. I won’t spoil it for you, you must hear them first-hand to appreciate them. Madam Noor Jehan, Farida Khanum and Mohammad Rafi. 4. Watch it for the sake of the art of movies. Watch because artistes from neighbouring nations have come together to produce entertainment despite our history of hatred, war and distrust. Watch because there are a couple of feet-tapping numbers, and for Ranbir Kapoor’s ability to make you chuckle with his ridiculous signature onscreen antics. He had us in stitches and I could have sworn that the uncle in front of me thought it’s more than just a time-pass, especially when RK did his song-and-dance in his boxers. (Sorry, that was a spoiler, but not a big one. Now you can watch the film waiting for that scene to arrive, and expect it to be drop-dead hilarious, well worth the wait.) Best to keep the popcorn-buying until the intermission. 5. Watch because it has Imran Abbas. Although Imran Abbas had a really small role, and even shorter onscreen time, who doesn’t love flawless Urdu in a true Pakistani accent? And of course, the eye candy factor cannot be ignored. Watch the first-half of the movie, at least, if not the whole! The first half actually has alot going for it – a great deal of Anushka-Ranbir chemistry and some seriously-funny dialogues. P.S. Guest Appearance Alert! I won’t tell you who that is. Some things need to be kept to oneself, especially in a FUCHSIA Review. Bittersweet is always better than just bitter or just sweet. You get a flavour of both, and you learn to appreciate that moments like these, films like these, will be made so that audiences like us can enjoy a very well-deserved ‘time pass’ over the weekend! So, go watch it! I’ve said enough, this review is over. Bittersweet to the very end!